This was such a fun, easy prep activity for the kids! I got this idea from @learninginroom122 on Instagram. All you need are some book orders, glue, scissors and blank paper. 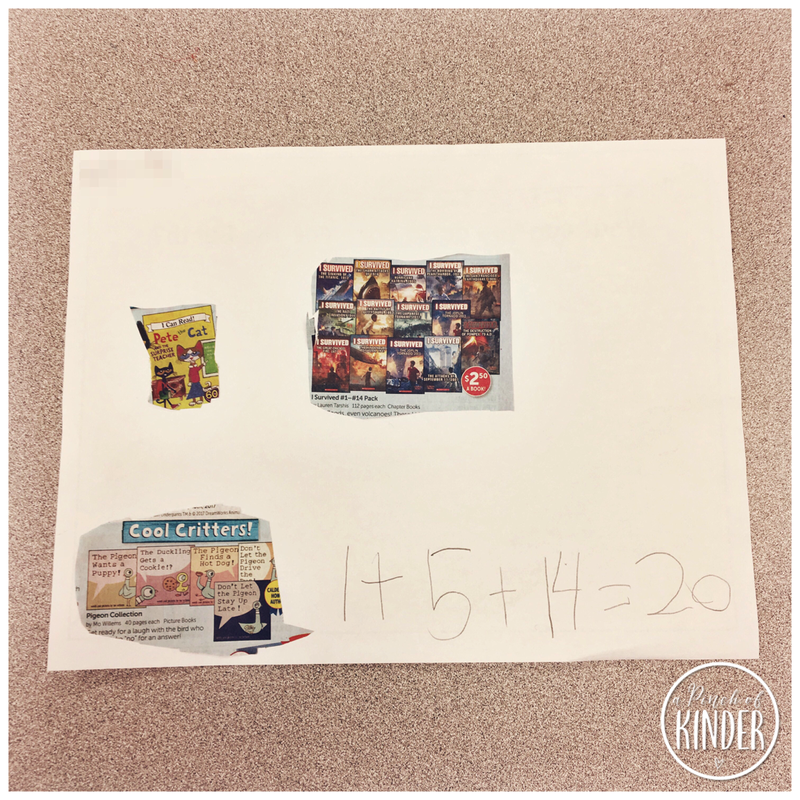 Have the students cut out books, glue them on the paper and add them up! 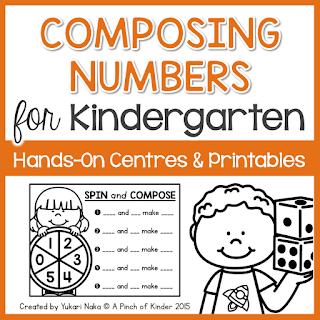 If addition is too tricky for some of your kids then you can also have them just count and write the number! Easy to differentiate! I finally had the opportunity to play this game with the kids on Friday! How to play: Each player starts with 4 hexagons. Take turns rolling the dice and placing the shape you roll on one of your hexagons. The first person to cover all 4 hexagons wins! It was fun seeing how they negotiate taking turns, following rules etc. and it was also great for me to see their spatial awareness when covering the hexagon. Balancing the pattern blocks on the hexagon was a bit of a challenge for some of them too! It was great fine motor practice though! 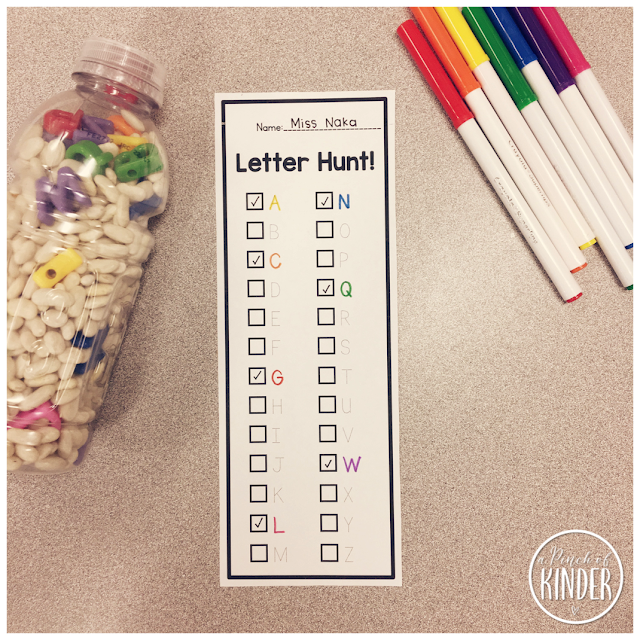 For this activity, I just filled a Vitamin Water bottle with beans and letter beads (A-Z) and set the bottle out with this printable. The students were asked to find letters, trace them on the sheet and check it off. The challenge was to try to find all 26 letters. 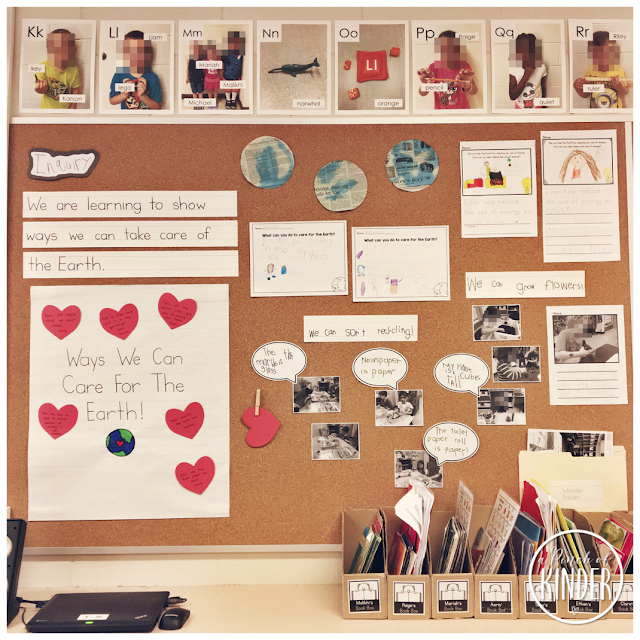 We started a new inquiry this week so we took down our Earth Day bulletin board. Earth Day stuff is not inquiry (I was going to change the heading to "Belonging and Contributing" but ran out of time.. oops) but I used this board for the few weeks we were focusing on it. I had a lot of fun teaching it this year, maybe because I was well planned and knew I was teaching each activity with intention! I used my new Earth Day unit which has 8 detailed lesson plans and corresponding anchor chart pieces! I'm hoping to put together a full Earth Day blog post sometime in the near future to show you details of each activity you see on the bulletin board and more! 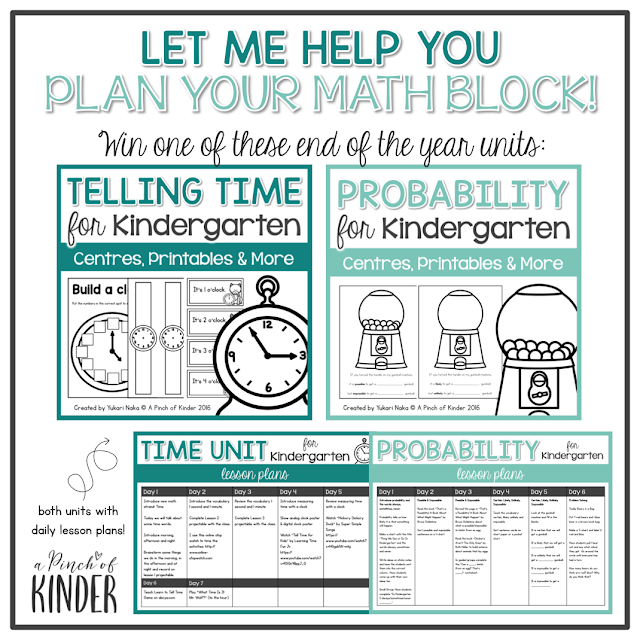 I was planning my math block for next week on Thursday night and realized I could just pull out my probability unit, print the lesson plans and I would be ready to go for the next week and a half! It saved me so much time and allowed me to focus on writing some COL's instead and maybe actually enjoying my long weekend! So I thought hey, why not share some of that time saved with people who follow my Instagram? So I'm hosting a quick giveaway over on my Instagram account. It closes in 3 hours, so hurry! Click here or look for the photo below on my Instagram page for details on how to enter! If you missed the giveaway but are interested in either of these units you can find the Telling Time unit here and the Probability unit here. 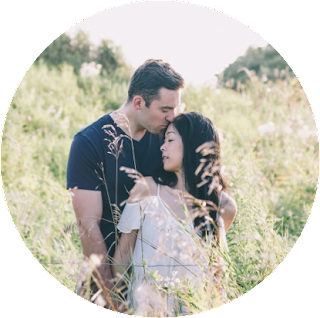 You can click on the button below to check out more Five for Friday posts! Hi friends! Can you believe it's already mid-May? 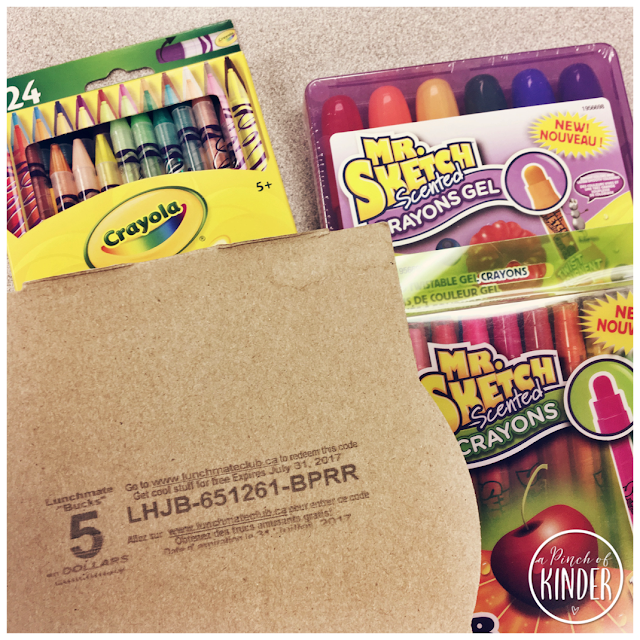 I'm here to share with you some new activities from our classroom from the week. 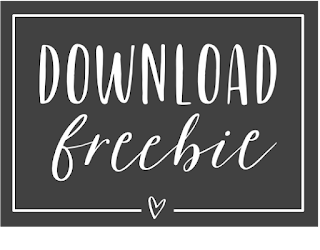 I hope you can use some of the ideas and freebies! 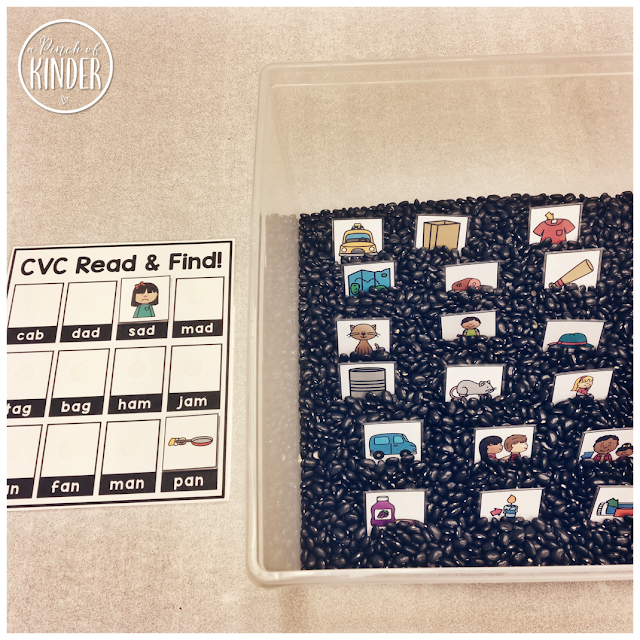 I found these cute letter beads at Walmart and knew I wanted to use them for a literacy centre. When I came across this image on Pinterest, I knew it was the one I wanted to try with these letter beads! I saw this invitation to create, draw and write on @kinder_owls's Instagram and knew I wanted to try it. I love open-ended invitations that all kids can participate in! I set out the prompt "Can you make a spring picture?" 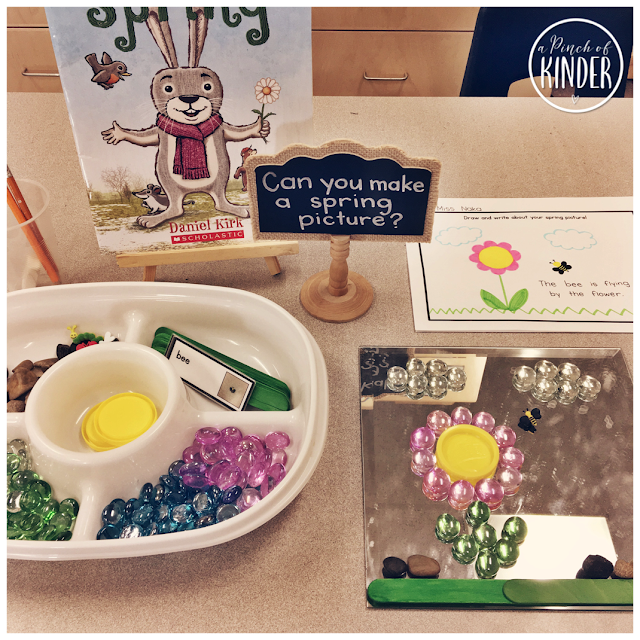 with a spring themed book and some loose parts (green/clear/pink/blue marbles, green popsicle sticks, bug buttons, word cards that match the bug buttons, rocks and yellow play doh lids). The kids loved it and many of the kids decided to document their thinking using the recording sheet I provided. Want pages for all 4 seasons? 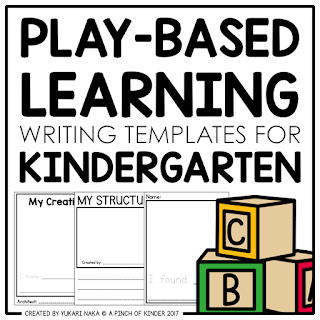 Fall, winter and summer are included in my "Play-Based Writing Templates for Kindergarten" pack on TPT. You can click here or on the image below to check it out if you are interested! 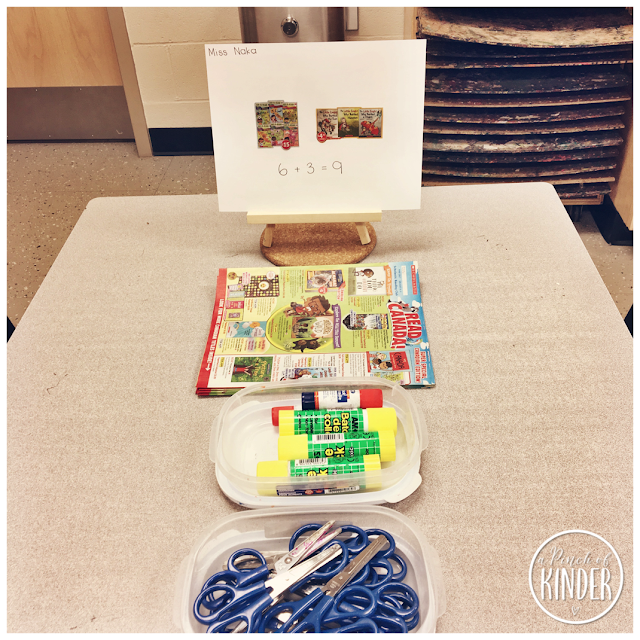 I printed and laminated a couple new centres to use both as an independent centre and as an activity for guided math. Composing numbers is an area of need, especially for a lot of my JK's so I printed this "Place and Compose" centre. 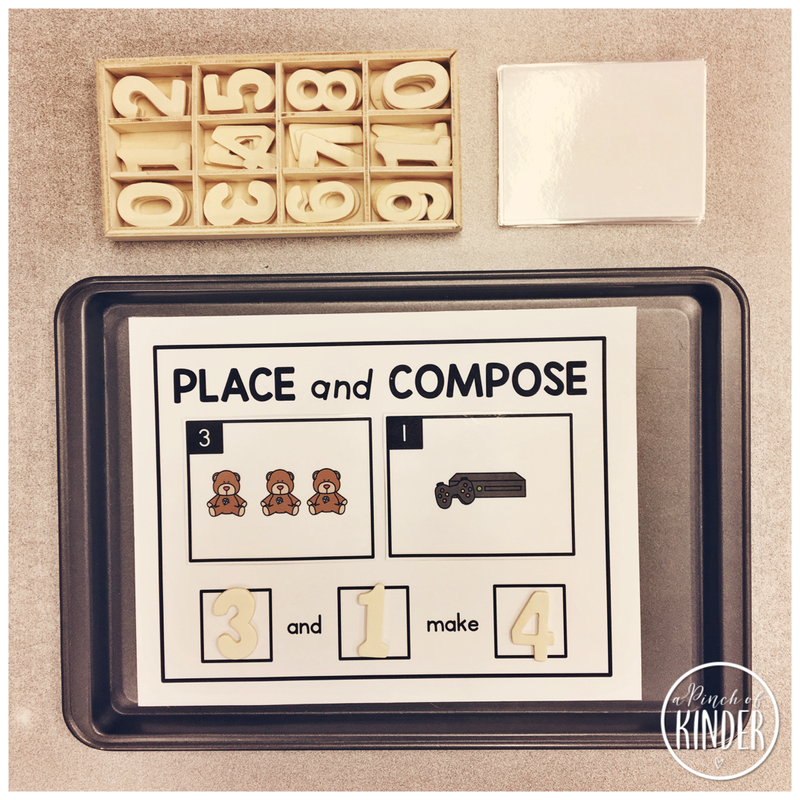 The kids take 2 cards off the top of the pile, put them on the boxes and compose the two numbers. 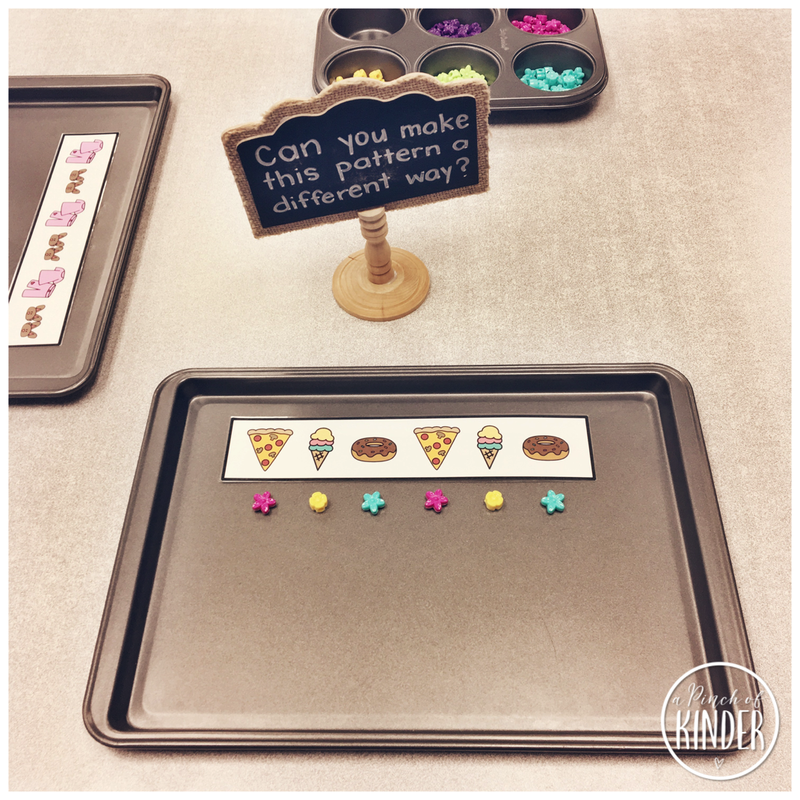 Something that is new in the Kindergarten Program this year is translating patterns. 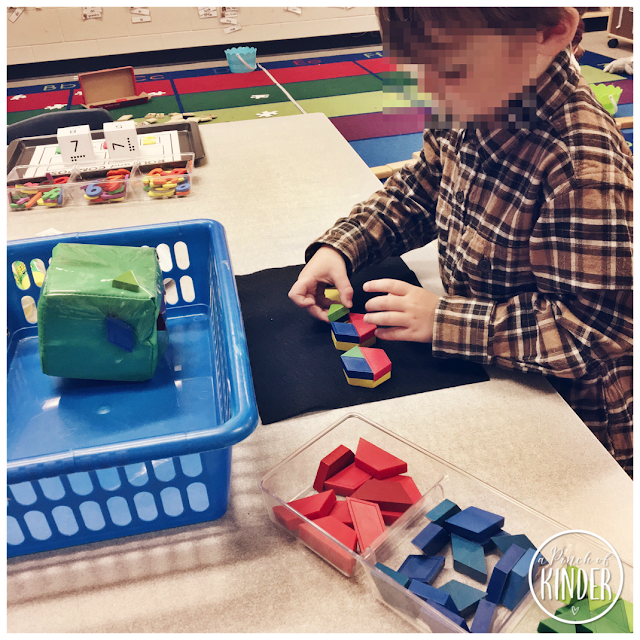 I was struggling with teaching this concept to the kiddos but then my teaching partner told me how she used felt leaves and had the kids translate the patterns with snap cubes. So I decided to try something similar. I made these pattern strips and asked the kids to show me the pattern in a different way. We did it whole group at first and then I set them out with manipulatives for the kids to try. I thought it was good practice! It is still tricky for some of them but a good challenge for some of my higher kids. I have been collecting Lunchmate bucks forever! I wanted to share this tip with you in case you didn't know about it. But first here is $30 worth of school supplies I got for FREE because I got Staples Giftcards by redeeming my Lunchmate bucks! 4. When you have enough points (you can only redeem 10 codes a day) you can go to the Rewards section and redeem them for gift cards! They have gift cards for Staples, Indigo, Toys R' Us and more! It is a little tedious but it only takes a couple minutes of your time everyday and eventually you get some stuff for free! 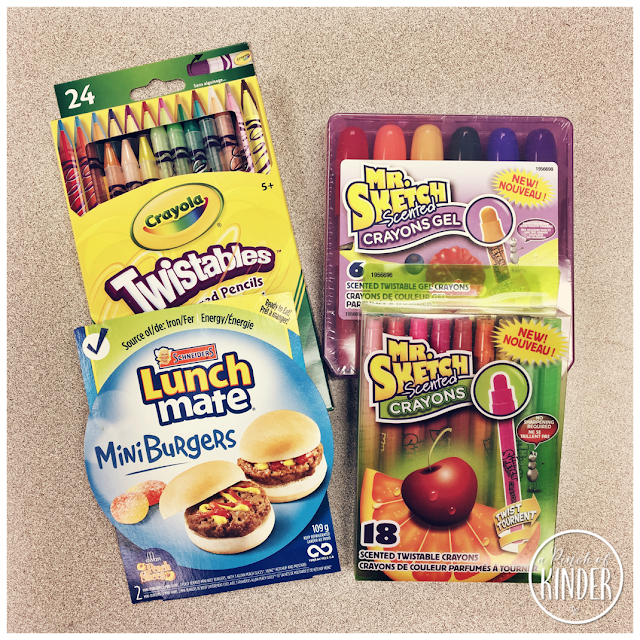 My kids were super excited when I showed them our "special art supplies" we got with our Lunchable points! Ok that's it from me for this week! I hope you were able to find something you can use from this post! 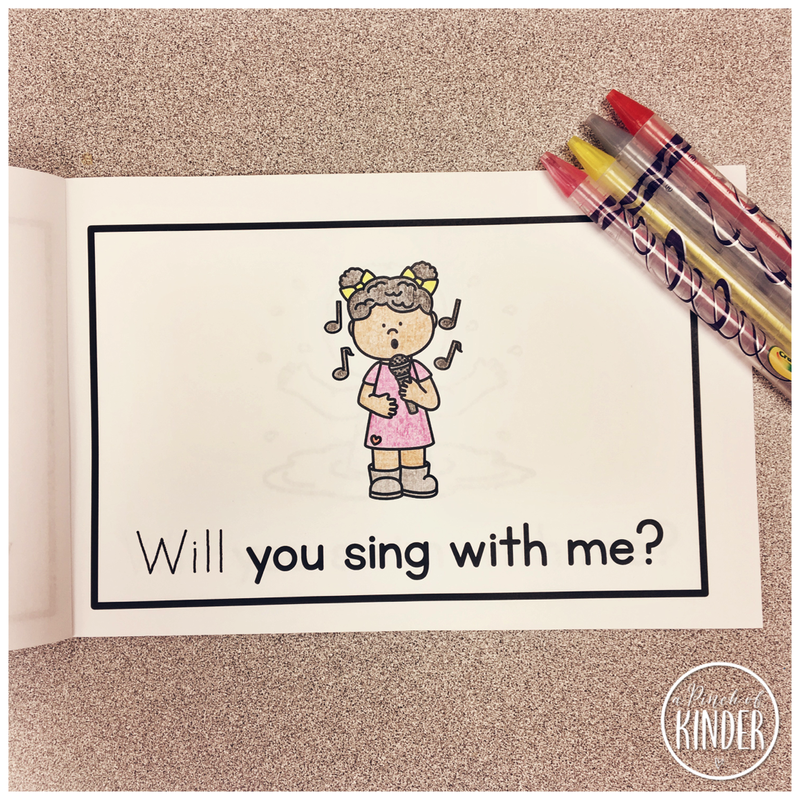 Life has been a little busy for me lately but I'm finally back to share some things that are happening in my classroom! Here are 5 things from this week! During guided reading I was noticing that some of my kids were having a hard time stretching and blending the sounds in CVC words. So I made up these CVC Read & Find mats to encourage them to practice the skill during centre time. It was a surprising hit and even kids who usually don't go to "academic" centres were trying it out. 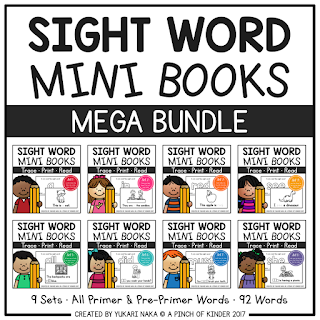 We did short a words this week so I'm planning to put out short e words next. 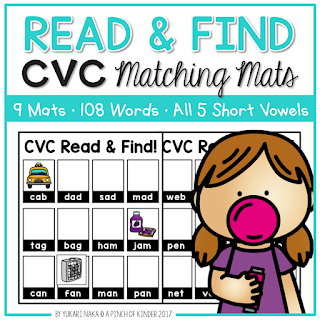 You can find these CVC Read & Find mats/cards in the product below. Click here or on the image to check it out on TpT. I always like to start Mother's Day gifts early so we don't feel rushed the week of. 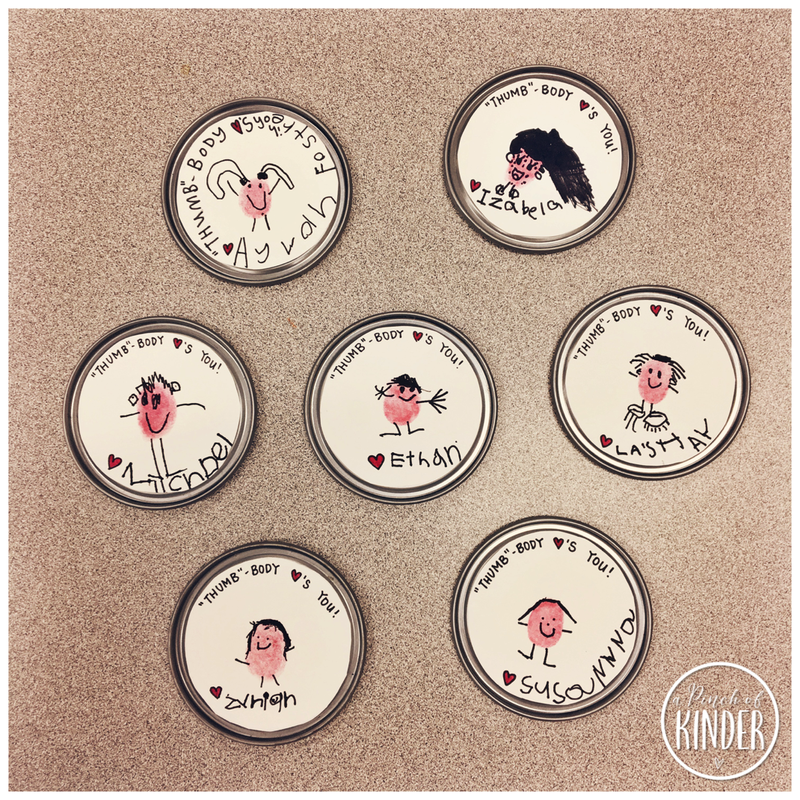 This year we made these "Thumb-body Loves You!" magnets! 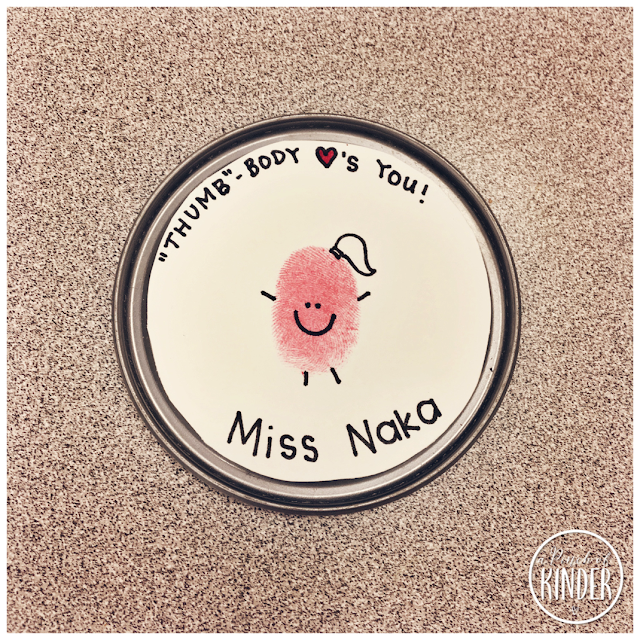 I cut out a circle from cardstock to fit the juice lid (my teaching partner had a bunch she had saved from frozen juice concentrates) and the kids put their thumbprint in the middle (we used an red inkpad) and wrote their names at the bottom. Then I wrote in "Thumb-body Loves You!" and taped it on the lid. On the other side we added a magnet so that it could go on their fridge at home! Here are some by the kiddos. They turned out soooo cute! One of my kiddos even wanted to do the "Thumb-body Loves You" part all by herself and did such a good job writing in that small space. We hope the moms love it when they open it next weekend! 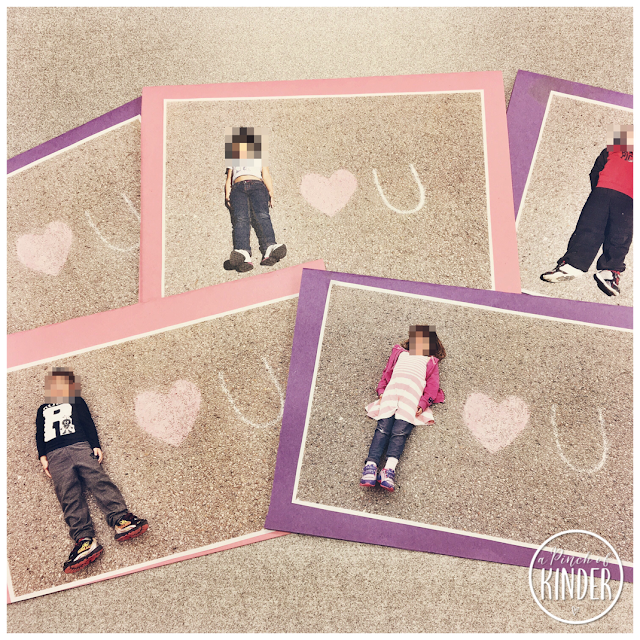 We always do a card as well and this year we decided use this adorable picture idea from Burgh Baby and make it the cover for our card! I drew the heart and U with chalk on the pavement of our Kindergarten pen. Then I had the kids lie down on the pavement so their bodies would look like the letter I. Then I got up on a ladder to snap the picture. For the inside I had the kids tell me what they wanted to write in their Mother's Day cards and then I typed it into a word document. I typed almost exactly what the kids said. 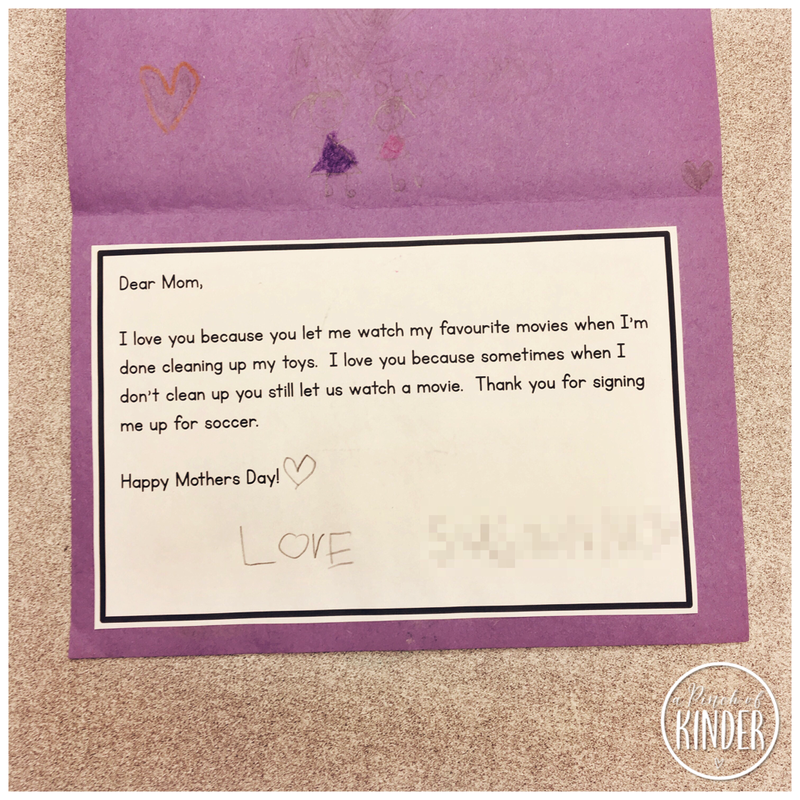 They needed very few prompting and if they did I prompted them with questions like "What is your favourite thing about your mom? What is your favourite thing to do with your mom?" etc. They came up with some adorable things to say, so again I'm hoping the moms will love it! Stamping with paint and cookie cutters is my go-to for decorating gift bags. It's easy, cheap, low-prep and each bag turns out unique and beautiful. It doesn't get much better than that! 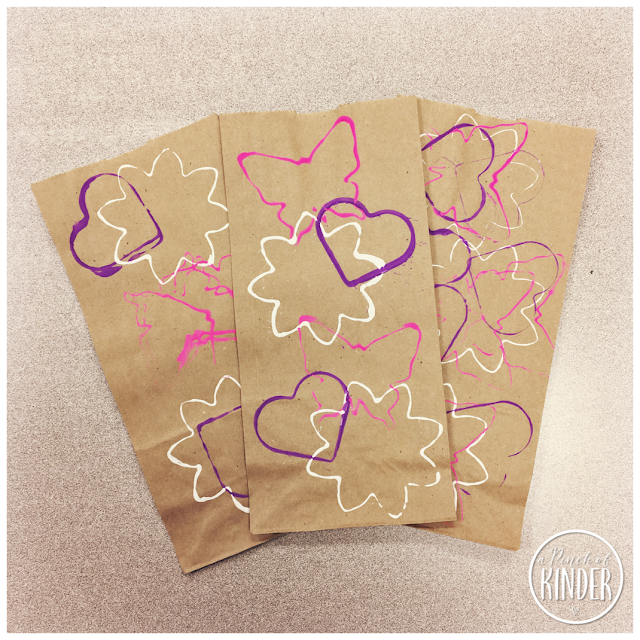 For Mother's Day gift bags we used butterfly, flower and heart cookie cutters and pink, purple and white paint. We'll put the magnets and cards inside (or staple the card to the back if it doesn't fit inside) and send them home on Thursday! 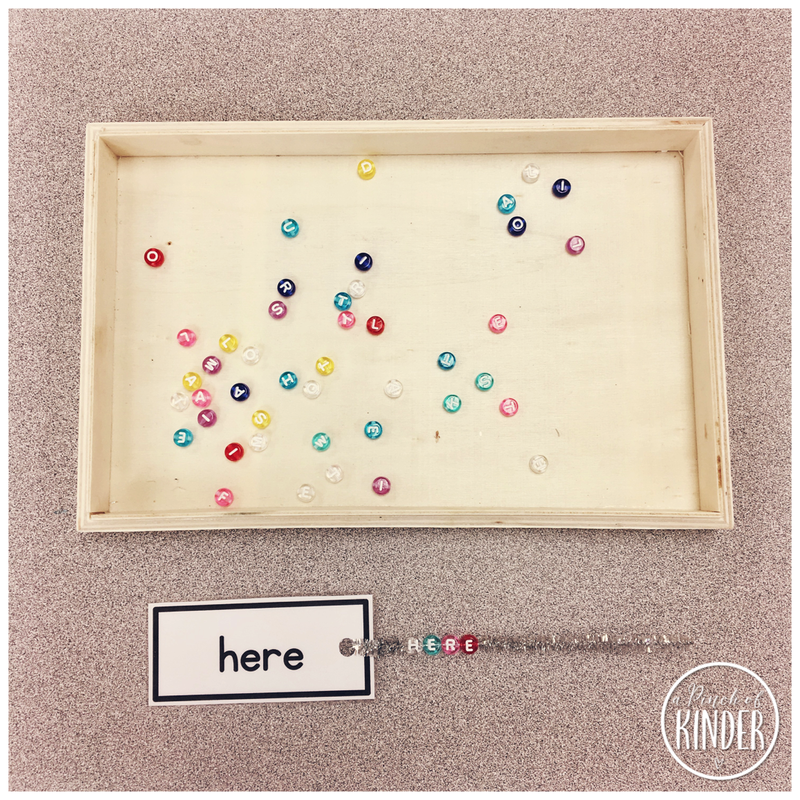 I'm always thinking of new and engaging ways for the kids to practice sight words independently at centres. I also wanted something that they could do at centres and then put in their book boxes to read at independent reading time. 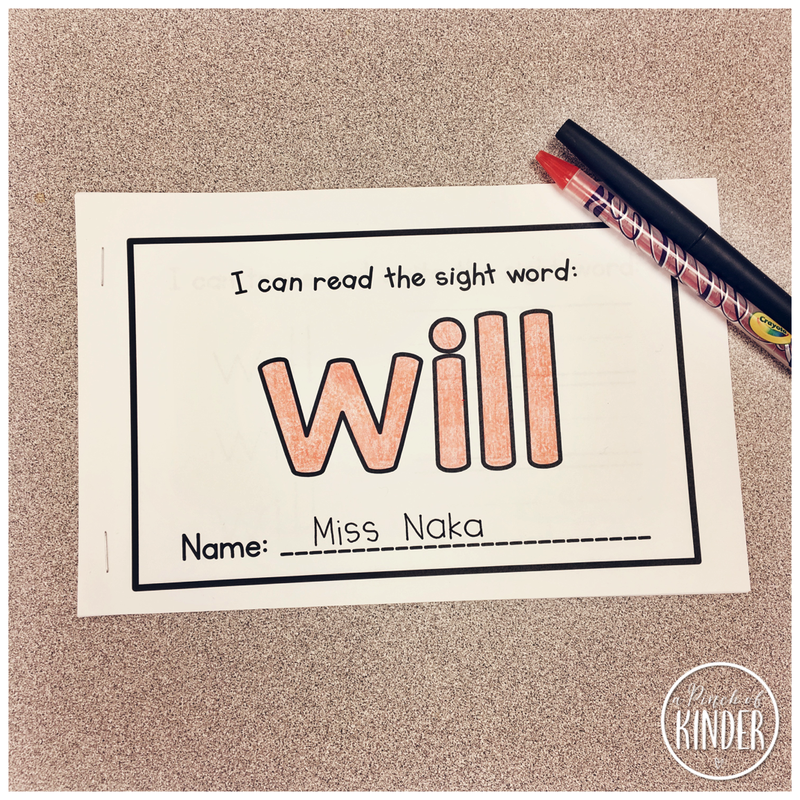 So I made up this mini sight word practice booklet + mini reader to try out this week with our focus sight word and the kiddos loved them! First the kids colour the word on the cover (you could also get them to rainbow write) and write their name. Then they practice both tracing and writing the word. 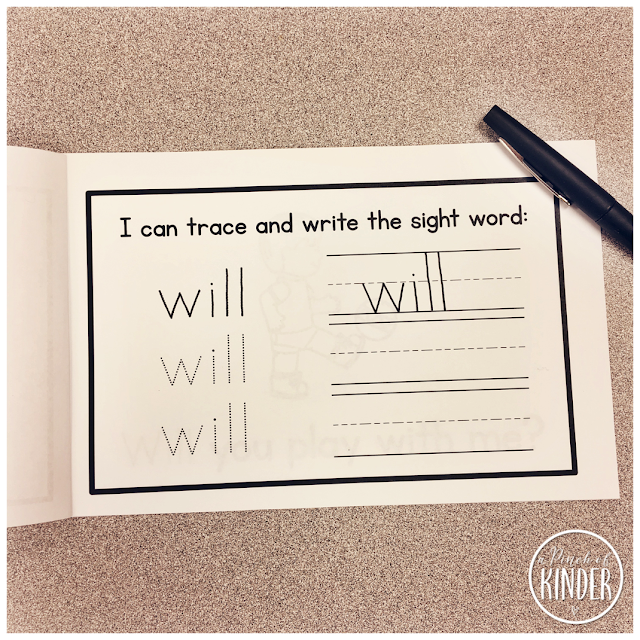 Then there are 4 pages where the kids can trace the sight word in a simple sentence and read the sentence. I'm thinking of making these for all pre-primer sight words but we'll see if I can find the time! I'm also thinking of adding tracking dots under the words with 1:1 correspondance. Let me know if you have a preference and I'll keep it in mind when I'm working on them! Ok that's it from me this week! 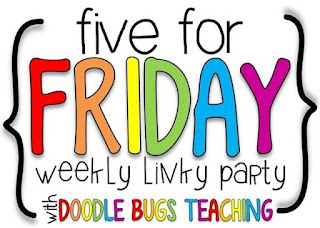 If you are interested in checking out other Five for Friday posts you can click on the image below to check our the linky!